There is the perfect T-shirt, and the perfect stiletto, and even the perfect swimsuit, but no article of clothing is quite as transformative as the perfect pair of jeans. Discover your pair and suddenly you’re a head-turning, traffic-stopping, show-running knockout. As lovers of fashion and powerful women, we knew we had to design our spin on the perfect pair of jeans, and let us tell you: you’re going to want to try these babies on. We’re calling this new style our “Denim Perfect” jean for obvious reasons and it does everything your A+, #1 pair does, and then some. “The secret sauce with these jeans is really two things,” Express women’s denim designer Melody Rains explained during a walk-through of the new collection, “First, is the special new fabric with tight compact weave, high recovery Lycra, and combed cotton, which holds you in and lifts you up, while still feeling comfortable to wear. 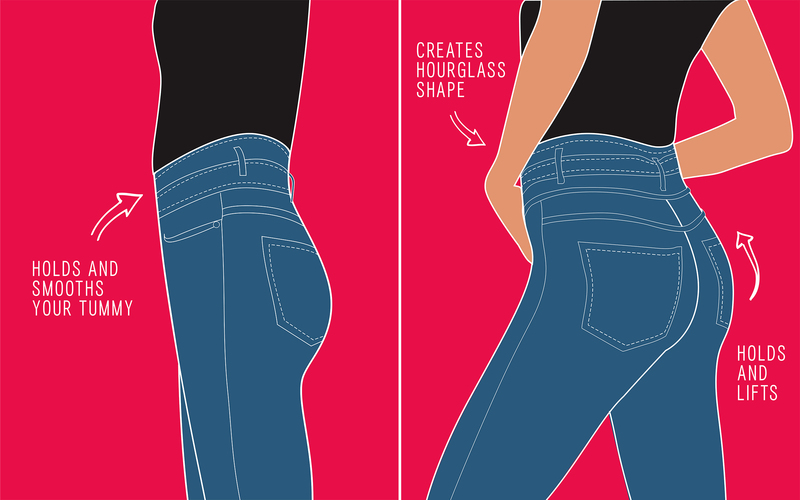 Secondly, front pocketing that goes all the way across so it holds you in and smooths your tummy”. As if that wasn’t enough va-va-voom for one pair of jeans, Melody and her team also designed every style to have a high-rise or super high-rise fit in order to give you that oh-so-flattering hourglass shape. Did we mention they start at just $88? Run don’t walk to get your pair of Express Denim Perfect jeans online and in stores as of today. And don’t forget to show us how great you look in them at @express on Instagram using #ExpressLife.